With a focus on the making of allegorical animal forms, Susan O'Byrne's practice draws on familiar and historical craft traditions to develop a unique set of ceramic making processes which aim to articulate human sensitivity. The techniques she now employs in her ceramic process combine a childhood obsession with making in papier-mâché, an influence of domestic and historic craft, the practice of mosaic and collage as well as a continued interest in drawing. Susan was born and grew up in Cork, Ireland. 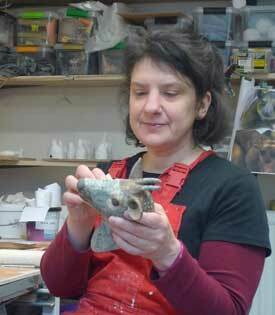 She completed a post-graduate diploma in ceramics at Edinburgh College of Art (ECA), Scotland, after graduating with a diploma in design and applied art at ECA in 1999. Since that time, Susan has taught extensively in Scotland and in the UK, and since 2009 has been dedicated to a full-time practice in making. She also currently directs and manages Glasgow Ceramics Studio in Scotland.